Many years ago, in my high school cooking class, Mrs. Mathews gave the class a spaghetti and garlic bread assignment. Two things stand out about that day. First, she had us make our own pasta, which blew my mind. The mere fact that normal people could make their own spaghetti noodles was shocking to me. Second, Mrs. Mathews wanted us to put carrots in the spaghetti sauce. I’ll never forget when she came up to my group’s station, looked at the sauce and comment on how the carrots gave it a robust color. It was all I could do to not give her some side eye. 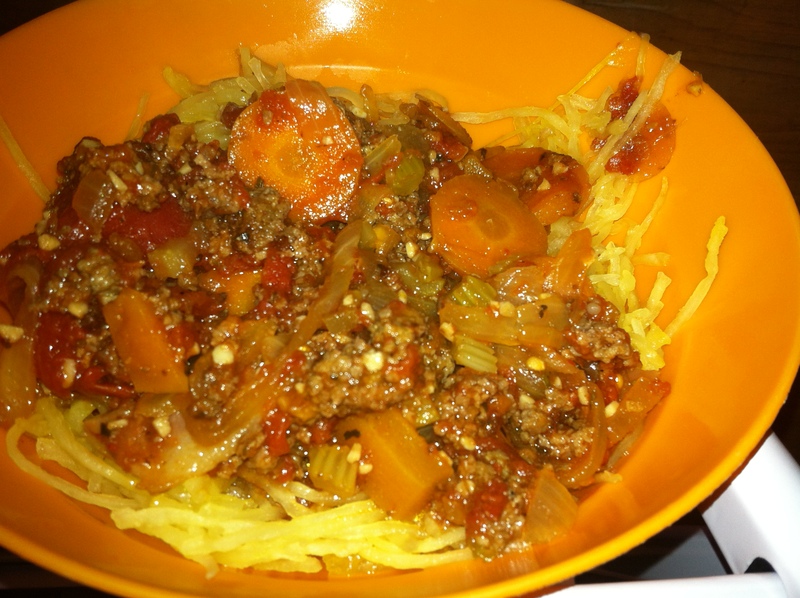 I mean seriously, carrots in a spaghetti sauce? If I were Italian, I’d die a little on the inside at the mere sight of the weird orange color that the sauce displayed. Flash forward fifteen years and I’m going to give you guys a recipe for a spaghetti sauce with carrots in it. Heck, were going to take it further off the grid. Not only are going maverick with the carrots, but we are also going to make our own noodles. Sort of. Instead of using grain noodles, we’re going to use vegetable noodles. Why deviate so much from the traditional Italian flare? Because this is America, not Italy. If Italy has beef with that, we can take it outside. This is what the sauce will look like without the meat added. NOTE: The other day, I was telling someone that I’m currently following a paleo diet. Read this as: ‘I’m eating more fruits, vegetables, and meats from local farms while decreasing my consumption of processed foods and grains down to about once or twice a week.’ The person I’m speaking to is a vegan and she explained that if I took out the part about the meat, I’d have an ideal vegan diet. This brings me to my point about a new tab I’m using: if you just take out the meat and substitute the butter for olive oil, you’ve got a vegan meal. So when you see the Modify for Vegan/Vegetarian tag, just drop the meat. Melt the butter in a large pan. Add the beef and the bacon and cook for about five minutes. Don’t over cook this because we’ll be boiling it into the sauce later on. 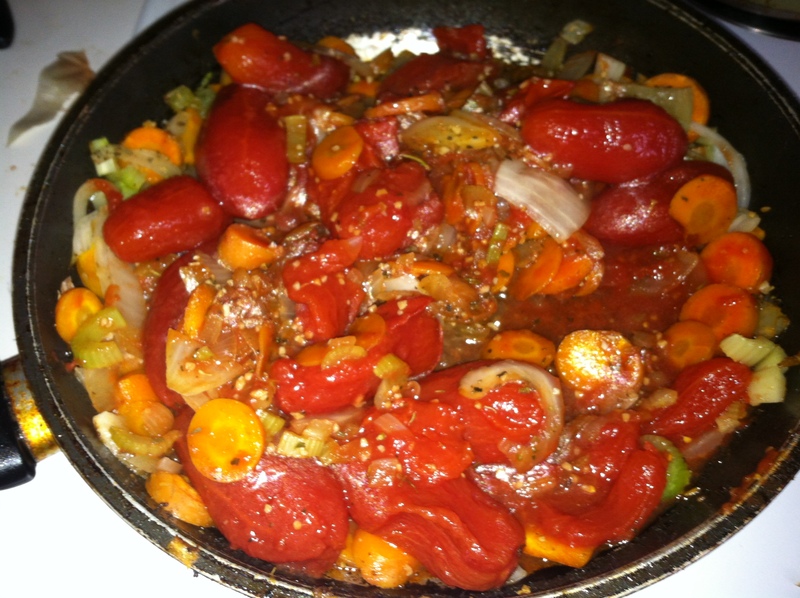 At the five-minute mark, set aside, but leave some of the grease to sauté the vegetables in. Add the chopped carrots, celery, onion, garlic and oregano and cook until the onions are soft over a low to medium heat. This is what it looks like with a little scrapping. Notice how the strands naturally noodify on you? While is going on, we are going to get the spaghetti squash ready. 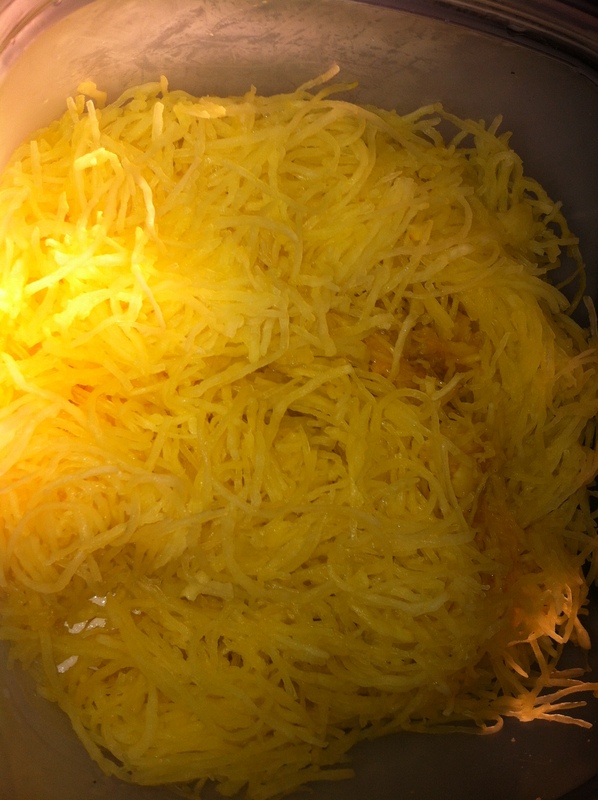 Cut the spaghetti squash lengthwise. Be forewarned, the squash is difficult to cut before it’s cooked so be careful with the knife and all the inherent stabbing motions that are going to be necessary to crack it open. Once you have it cut, scrape out the seeds and the weird inner squashy stuff. Don’t dig to deeply into the sides because this is where the strands of noodle come from. 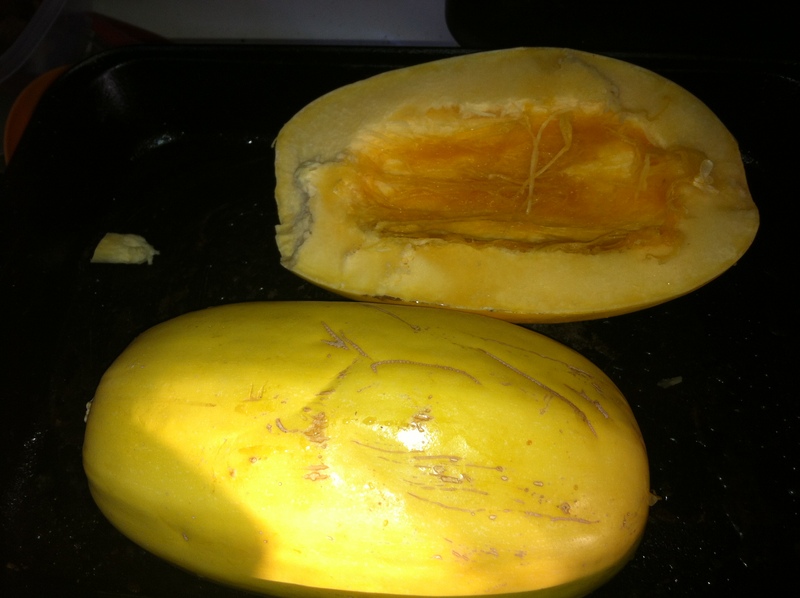 Place the squash halves onto a baking sheet and pop it into an oven at 350° for 30 minutes. Now, going back to the vegetables on the stove, add the tomatoes, tomato paste and return the meat mixture back to the pan. Don’t worry about breaking up the tomatoes; they will soften up during the cooking phase. Add in salt and pepper to taste and let the sauce simmer for 30 to 40 minutes. Once the squash is done, separate the strands by running a fork through the squash from stem to stem. 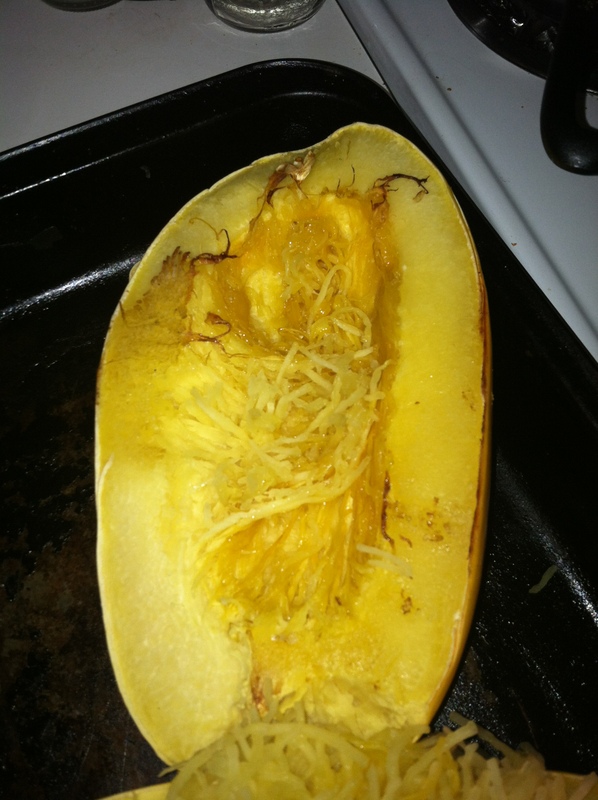 The most important thing about spaghetti squash is to not overcook it or else the strands will be too mushy. Move the spaghetti to a separate container and once the sauce is done, top with as much as you please.